Sri Lankan cuisine generally consists of rice, meat/ fish curry and few to several vegetable curries. My mother would always ensure leafy greens and fresh veggies were a stable part of our everyday diet! As a result of this, I rarely leave the grocery store without cucumbers, peppers and herbs such as mint and coriander leaves! 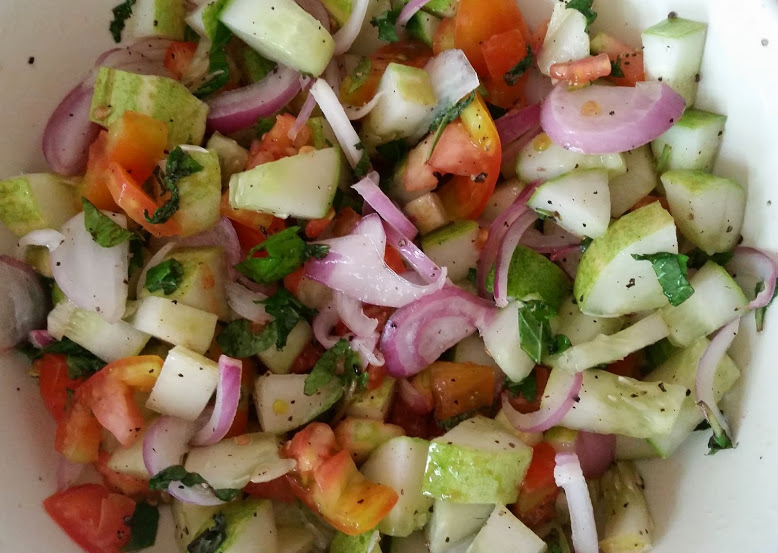 Here, in Sri Lanka, leafy greens are often incorporated as “sambols”: mixed/ cooked with chopped onions, tomatoes, shaved coconut and seasonings. Common greens include: kang kung (water spinach), spinach, gotukola (centella) and mukunuwenna (Alternanthera sessilis), among others. Salads are extremely versatile and you can make one, with any veggies you may have on hand, AND they’re an excellent way to have those fresh veggies and fruits in your diet! I cut the cucumber in half and removed the seeds. The cucumber was cut lengthwise into 4 and then sliced. The peppers and mint were coarsely chopped. The chunkier the better. The onion and tomato was sliced, as I like to add dimension to my salad. Sprinkle with the chopped mint, lemon juice and season to taste. I like my salads to look colourful, hence the use of different coloured pepper. You can use green peppers, even some chopped coriander leaves and season with some dried Italian herbs such as thyme, rosemary and oregano. A tablespoon or 2 of Greek yoghurt added in, makes it perfect for those hot summer days, when all you want is to cool down! Voila! And that’s ready for the lunch/ dinner table! Here’s another salad I made, when I didn’t have any peppers on hand. This one is seasoned with some salt and pepper and chopped corainder and mint leaves. Bring on the creativity! The vistas and possibilities ahead of you are endless!